Buy natural turf varieties online and have them delivered to your door. HG Turf is a family-owned company committed to growing and supplying premium quality lawns, sown down with the latest and improved varieties and delivered fresh from the farm. Recognised as Melbourne’s premier turf supplier, HG Turf has supplied the iconic MCG, Etihad Stadium and most famously, the 2000 Olympic Stadium and 2006 Commonwealth Games. The existing HG Turf website was dated and required a rebuild from the ground up. The new site needed to showcase the business’s products and also enable online sales. 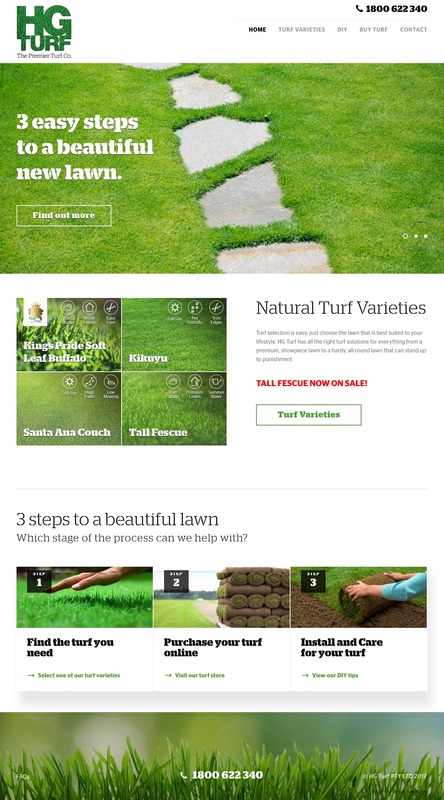 Customers can securely order their turf online via the custom online checkout process we built, which ties into the industry leading payment platform, Stripe. Not only is Stripe a fantastic product to work with, it also bypasses the need for expensive and unnecessary payment gateways and merchant bank accounts. Ecommerce simplified for everybody!